Tom Norton (centre) celebrates scoring a Phantoms goal. Two of Phantoms’ finest servants are back for next season. Player-coach Tom Norton and forward Will Weldon have both agreed deals for the new NIHL Division One South campaign. Norton has earned a reputation as one of the classiest defencemen operating in the second tier of the sport, but he’s not just a top performer in his own zone. The 28 year-old became a big attacking weapon during the course of last term when contributing 12 goals in a total haul of 37 points. Head coach Slava Koulikov said: “Tom provides the complete package for a ‘D-man’. His game is good in all three zones – with or without the puck. “He understands the modern game and it is great to have him as part of the coaching team as well as being a senior player. “He did a really good job with our group of defensive guys and I’ll be counting on him to do the same again this season. 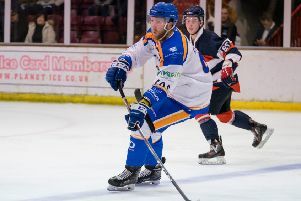 Norton’s fellow Nottingham-based player Weldon returns for an eighth successive campaign in Phantoms colours – a record which makes him their longest-serving player in terms of an unbroken stay at the club. The 25 year-old racked up 53 points last season when one of Phantoms’ assistant captains and he’s another man held in high regard by his coach. Koulikov added: “Will is a very popular figure in the locker room, a fans’ favourite and a great leader. “He can score goals, he can make goals and he also plays with so much grit. The new NIHL Division One South season begins in September and Phantoms will prepare by facing the team who pipped them to title and play-off success last season. Koulikov’s men meet Basingstoke, who have suffered a mass exodus of players during the summer after coach Doug Sheppard moved on to Bracknell, in the Billy Glover Memorial Cup. The two-legged clash takes place in Hampshire on September 8 ahead of a return fixture at Planet Ice the following night. Further games are also expected to be added to the pre-season schedule. Phantoms have requested to play home games on Sundays again next season after moving to Saturdays last season.